The prime minister has met Scotland's first minister in a Glasgow hotel as she prepares to formally trigger Article 50. 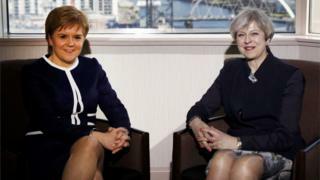 Theresa May and Nicola Sturgeon held talks for about an hour during the prime minister's trip to Scotland. Ms Sturgeon said the talks were cordial but she was "frustrated by a process that appears not to be listening". 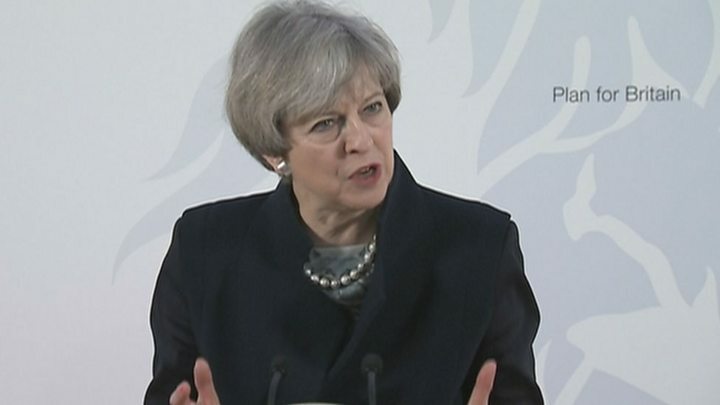 The prime minister had earlier repeated her opposition to an independence referendum during the Brexit process. The Scottish Parliament is expected to back Ms Sturgeon's call for a referendum on Tuesday. The first minister says a fresh vote is needed ahead of Brexit to allow the people of Scotland to choose which path to follow. Mrs May has repeatedly said that "now is not the time" for an independence referendum, but has not ruled out one being held after the Brexit process is complete. Ahead of the meeting, the prime minister said leaving the European Union would be an opportunity to strengthen the ties between the nations of the United Kingdom. 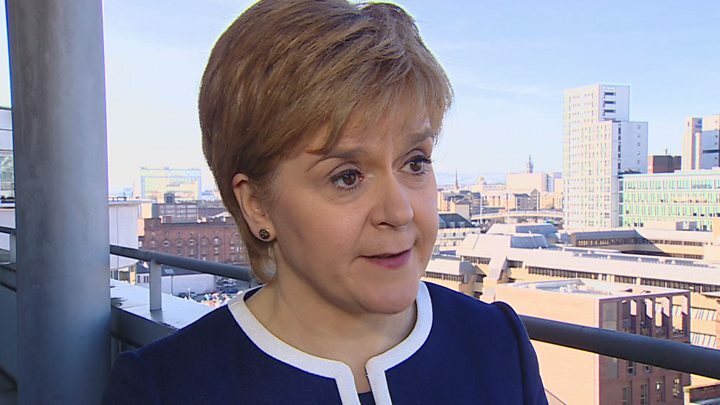 Ms Sturgeon later told BBC Scotland that she had wished the prime minister well for the forthcoming negotiations with the EU, which she said the Scottish government wanted to play a constructive part in. But she said she had been frustrated that Mrs May had not made any concessions over the first minister's demands for a distinctive Brexit deal for Scotland. The prime and first ministers do not see eye to eye. Not out of badness but because they disagree fundamentally and deeply about the future of Scotland. Such differences cannot be elided by a relatively short chat in a Glasgow hotel. There was symbolism surrounding all of the prime minister's visit. Theresa May was out to demonstrate that Scotland was a key part of her thinking ahead of the triggering of Article 50 on Wednesday, beginning the process of removing Britain from the EU. The first minister also said Mrs May had told her that she expects the terms of the UK's future relationship with the EU to become clear within the next 18 to 24 months - within Ms Sturgeon's timetable for an independence referendum. Ms Sturgeon said: "I have said that I want people in Scotland to have an informed choice when the terms of Brexit are clear. "She has confirmed to me today that that will be in a period from autumn next year to the spring of 2019. That would underline my view that is the right timescale". Media captionNicola Sturgeon: "I continue to be frustrated by a process that does not appear to be listening." Media captionTheresa May: "When this great union of nations sets its mind to something and works together with determination, we are an unstoppable force." Mrs May, who will trigger Article 50 on Wednesday, earlier told staff at the Department for International Development (DFID) in East Kilbride that she wanted Brexit to lead to a "more united nation". She pledged that leaving the EU would not mean the UK "stepping back from the world", and insisted she was aiming to build "a new partnership with Europe" while taking the opportunity to build "a more global Britain". The prime minister added: "As Britain leaves the European Union, and we forge a new role for ourselves in the world, the strength and stability of our Union will become even more important. In an impassioned plea for the preservation of the UK, she said the nations of the United Kingdom were an "unstoppable force" when they acted together. Mrs May - who did not take questions following her 10-minute speech, which focused largely on DFID's international aid work - also said the UK was "a force for good, helping to build a better future for everyone". She added: "As we look to that future and as we face this great national moment together, I hope you will continue to play your part in the great national effort we need to build the stronger Britain, the fairer Britain, the more outward-looking Britain and the more united Britain that I am determined we should be once we emerge from this period of national change." Mrs May insists that there have been "considerable discussions" with the Scottish government and the UK's other devolved administrations as she seeks to get the best Brexit deal for the whole of the UK. And she has said that there are areas where the UK and Scottish governments are in agreement, such as workers' rights. Mrs May was speaking as Labour outlined "six tests" that will need to be met in order for it to support any Brexit deal negotiated by the government. Downing Street had said that the talks between Mrs May and Ms Sturgeon were for issues surrounding the triggering of Article 50 - and not the possibility of a second independence referendum. But Scottish government sources said ahead of the meeting that the talks could not just focus on Brexit. Triggering Article 50 begins a two-year negotiation process to attempt to reach a deal before Britain officially leaves the EU in March 2019. The government is also due to publish its Great Repeal Bill, giving powers to amend some EU laws, on Thursday.